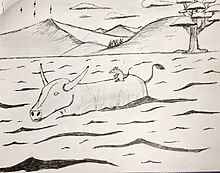 Aśðrgšhg2wgỳỳ Eeg4jv4=76 The Chinese zodiac is a classification scheme that assigns an animal and its reputed attributes to each year in a repeating 12-year cycle. The 12-year cycle is an approximation to the 11.85-year orbital period of Jupiter. . It and its variations remain popular in many Asian countries including China, Hong Kong, Taiwan, Japan, South Korea, Vietnam, Mongolia, Cambodia, Laos, Nepal, Bhutan, and Thailand. The Chinese zodiac is also called Shēngxiào (生肖) in Mandarin. Identifying this scheme using the generic term "zodiac" reflects several superficial similarities to the Western zodiac: both have time cycles divided into 12 parts, each labels at least the majority of those parts with names of animals, and each is widely associated with a culture of ascribing a person's personality or events in his or her life to the supposed influence of the person's particular relationship to the cycle. 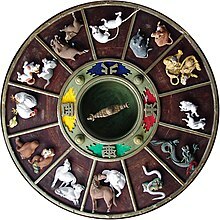 The Chinese zodiac is a classification scheme that assigns an animal and its reputed attributes to each year in a repeating 12-year cycle. The 12-year cycle is an approximation to the 11.85-year orbital period of Jupiter. . It and its variations remain popular in many Asian countries including China, Hong Kong, Taiwan, Japan, South Korea, Vietnam, Mongolia, Cambodia, Laos, Nepal, Bhutan, and Thailand. ↑ ""Almanac" "lunar" zodiac beginning of spring as the boundary dislocation?". China Network. 16 February 2009. Retrieved 5 January 2011. ↑ "Online Four Pillars Calculator". ↑ Cyndi Chen (2013-02-26). "The 12 Animals of the Chinese Zodiac 十二生肖". Archived from the original on 2013-03-06. Retrieved October 11, 2013. ↑ "Japanese Zodiac Signs and Symbols". japanesezodiac.org/. 5 January 2012. Retrieved 1 January 2015. ↑ Farouk Yahya (2015). Malay Magic and Divination in Illuminated Manuscripts. ↑ ""งูใหญ่-พญานาค-มังกร" รู้จัก 3 สัญลักษณ์ปี "มะโรง"". ประชาชาติธุรกิจ. 5 January 2012. Retrieved 1 January 2015. ↑ "การเปลี่ยนวันใหม่ การนับวัน ทางโหราศาสตร์ไทย การเปลี่ยนปีนักษัตร โหราศาสตร์ ดูดวง ทำนายทายทัก". Archived from the original on 2011-01-03.